U.S. #2975f – Though he led the Confederacy through the war, Davis had initially opposed secession. On November 6, 1861, Jefferson Davis was elected the first and only President of the Confederate States of America. 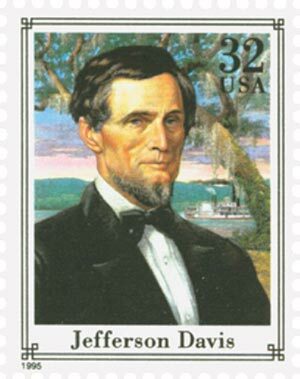 Jefferson Davis was born in Kentucky and grew up in Mississippi and Louisiana. He married Sarah Knox Taylor, former U.S. President Zachary Taylor’s daughter, though she died of Malaria three months into the marriage. Davis later developed a sprawling plantation in Mississippi, remarried, and raised a volunteer regiment for the Mexican-American War. After suffering an injury in the war, Davis served in the senate. U.S. #4446 was issued as part of a set of four stamps in 2010 honoring actors who popularized Westerns in the early 1900s. 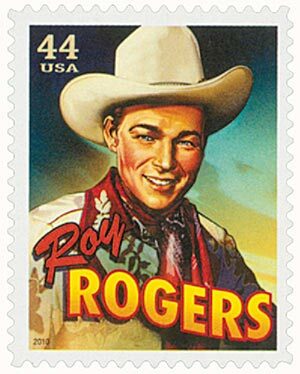 On November 5, 1911, future singer and actor Leonard Franklin Slye, better known as Roy Rogers, was born. When Slye was a child, his father brought home a cylinder player (the predecessor to the phonograph) and a cylinder by a Swiss yodeler. Slye played the cylinder again and again and developed his own style of yodeling. At the age of 18, he moved to California to become a singer. U.S. #897 pictures the Wyoming State Seal, honoring it as the Equality State. Wyoming has a proud tradition of leading the nation in women’s rights issues. Wyoming women were the first American women to vote, hold public office, and serve on juries. Women were granted these rights when Wyoming became a territory in 1869. In 1870, Esther H. Morris became our nation’s first woman justice of the peace in Wyoming. 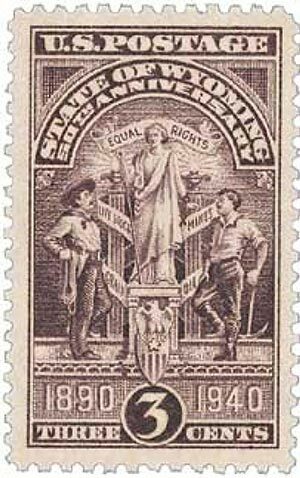 When Wyoming became a state in 1890, it became the first women’s suffrage state. 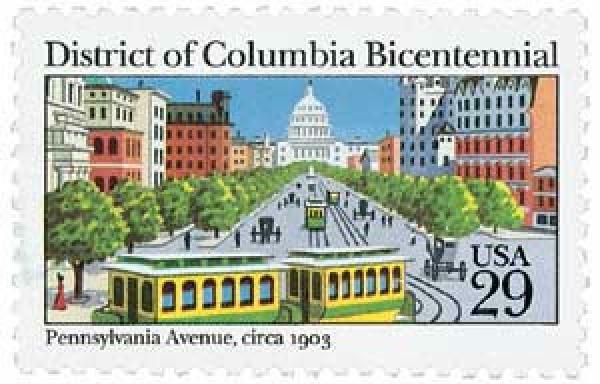 U.S. #2561 pictures the capital as it appeared in 1903. Though the District of Columbia has served as our nation’s capital since 1791, its residents didn’t get to vote in their first presidential election until November 3, 1964. Mystic president Don Sundman trades his 1¢ Z Grill for Bill Gross’ Inverted Jenny Plate-Number Block. Mystic made stamp history on November 2, 2005, when we traded our 1¢ Z Grill for the unique Inverted Jenny Plate Number Block. These are the rarest, most famous and valuable U.S. stamps. U.S. #2004 – When the complex was completed in 1897, it was the largest and costliest library in the entire world. 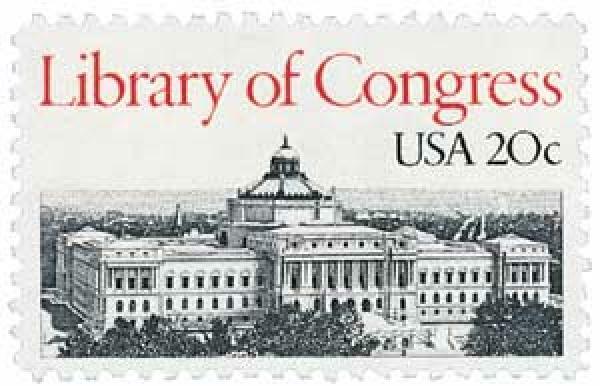 On November 1, 1897, America’s Library of Congress opened its doors. James Madison was reportedly the first person to suggest the establishment of a congressional library in 1783. The library was officially created 17 years later by President John Adams. The legislation set aside $5,000 for the purchase of books that Congress would find useful. The first collection was housed in the U.S. Capitol Building and consisted of 740 books and three maps. Two years later, when Thomas Jefferson was President, he appointed the first overseer of the library as well as a committee to regulate it.